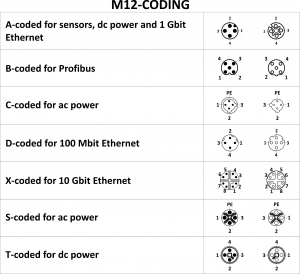 What is the meaning of “coding” in M12 connectors? 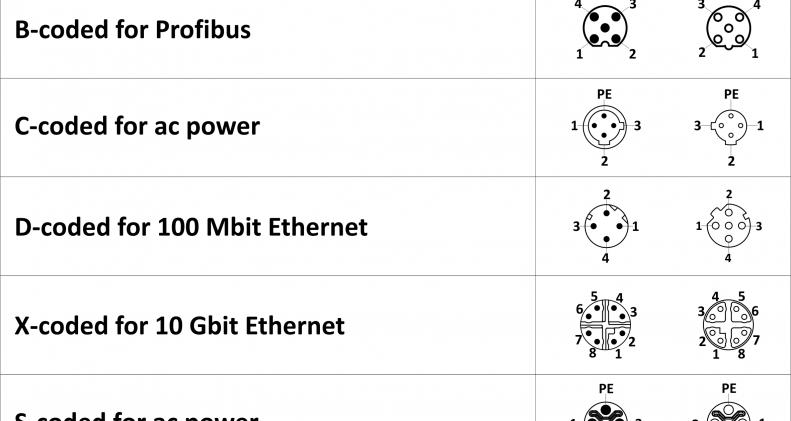 Katlax Blog > Uncategorized > What is the meaning of “coding” in M12 connectors? M12 connectors are circular connectors with a 12mm locking thread used for sensors, actuators, Fieldbus and industrial Ethernet, primarily in factory automation applications. They are available with 3, 4, 5, 8, 12 and 17 pins. The M12 family can be found in many applications such as factory automation, communications, measurement and control, food and beverage, transportation, robotics etc. When it comes to specific applications, users must select the right pin count. For sensors and power applications, 3 and 4 pins are required. Profinet and Ethernet use 4 and 8 pin counts. Fieldbus, CANbus and DeviceNet primarily use 4 and 5 pin counts. Finally, specify 12 pins for signal requirements. Several styles of coding exist in M12 connectors. This coding prevents incorrect mating on products. In addition, shielding is available in most coded M12 connectors. For example, X-coded connectors are specifically shielded by the design of their coding. A-, B-, D- and X-coded are most prevalent. This is because the A-, B- and D-coded connectors have been around for a long time and is some of the original M12 connectors. X-coded connectors are becoming more popular for high-speed industrial Ethernet and will eventually replace the A and D-coded parts for Ethernet applications. Which cable jacket material is best for your application ?